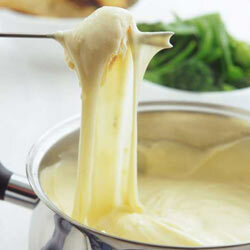 This easy cheesy fondue is comfort at its best. Rub the inside of a cheese fondue pot with the garlic. Add wine and heat on the stove. Once the wine is hot but not yet simmering, add cheese, stirring it in a handful at a time. Stir over low heat until cheese is melted. Mix together the cornflour and Kirsch and stir into the cheese mixture. Add lemon juice and freshly ground black pepper and nutmeg to taste. Once mixture is smooth and creamy, transfer the pot to the table and keep it heated over a low flame. Don't let the mixture boil. If it gets too thick, stir in a little more wine. Dip cubes of bread into the cheese mixture, stirring them around the bottom of the pot for great flavour and to prevent sticking.